One major contribution to the greater stability of the gauche is the stereoelectronic interactions, and this is best probed using the NBO (Natural Bond Orbital) approach of Weinhold (DOI: 10.1021/ja00501a009). The process is approximately described as first reducing the wavefunction down to a set of orbitals which have been localized (using appropriate algorithms) down to two or one centres (corresponding to two-centre covalent bonds, or one-centre electron lone pairs). Perturbation theory is then used to evaluate the interaction energy between any filled and any empty combination. 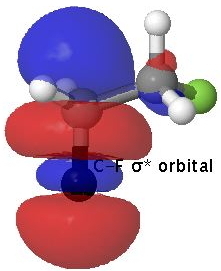 For the molecule above, six such combinations are inspected, involving any one of the six filled C-H or C-F σ-orbitals, and the best-overlapping σ* orbital which turns out to be located on the C-H or C-F bond anti-periplanar to the filled orbital. Filled C-H NBO orbital. Click for 3D to superimpose empty C-F anti bonding orbital. A filled C-H orbital is shown above on the left, accompanied by an empty C-F σ* orbital on the right which is anti-periplanar to the first. This alignment allows the phases of the two orbitals to overlap maximally (blue-blue on the top, red-red beneath). The interaction energy between this pair is determined not only by the efficacy of the overlap, but by the energy gap between the two. The smaller the gap, the better the interaction energy (referred to as E2, in kcal/mol). For the gauche conformation, the six pairs of orbitals have the following interaction energies; two σC-H/σ*C-F interactions (illustrated above), 4.9; two σC-H/σ*C-H 2.6 and two σC-F/σ*C-H 0.8 kcal/mol. For the anti-periplanar conformation, the terms are four σC-H/σ*C-H 2.5 and two σC-F/σ*C-F 1.8 kcal/mol. The two totals (16.6 vs 13.6) indicate that gauche is stabilized more by such interactions. There is of course a bit more to this story, but I have documented the above here, since I can include an explicit (and rotatable) illustration of the orbitals involved (which I have not seen elsewhere). If you want a recipe for generating these orbitals, go here. This entry was posted on Tuesday, April 6th, 2010 at 12:36 pm and is filed under Interesting chemistry. You can follow any responses to this entry through the RSS 2.0 feed. You can leave a response, or trackback from your own site. Henry – that is very interesting, considering that I am currently teaching Newman projections. What do you expect to happen for CH2FCH2Cl CH2ClCH2Cl and CH2FCH2OH? Combinations proven to exhibit the effect include FCH2CH2F, FCH2CH2OH, FCH2CH2OCOCCl3, ClCH2CH2OH, BrCH2CH2OH, MeOCH2CH2OMe. It seems also likely that another effect is responsible for gauche populations of n-alkenes, the non-bonded van der Waals dispersion attraction (worth about 0.13 kcal/mol for two argon atoms, it soon adds up for larger molecules). Having written the above, I have now explored wider examples of the motif X-C-C-Y. Thus I forgot to include X/Y=CN above, but more interestingly, X/Y can be a metal! Here we enter territory of whether the C-metal bond is electron donating or electron withdrawing. I have started to explore such systems in this post. Hi, I’m in an Advanced organic chemistry class and we recently leaned that for 1,2-dichloroethane the anti conformation is preferred over the gauche by about 1,2 kcal/mol. The explanation that was given was that in the anti conformation, the dipoles created by the 2 EWGs cancel and in the gauche conformation, the like charges repel each other causing destabilization. Wouldn’t this be the case for 1,2-difluroethane as well? Or do you predict that the dichloroethane compound would also be more stable in the gauche conformation? This is one of those areas where the full story is complicated. 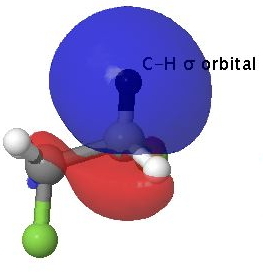 Firstly, it is worth pointing out that an orbital picture of a molecule, and one based on charges and dipoles are related. In the limit, analyzing the charges needs a summation of the charge, the dipole, the quadrupole, the octupole and the hexadecapole distributions. The electron distribution predicted by such a summation is the same as that predicted by molecular (or other equivalent) orbital theories. But whereas the MO approach is in effect already summed, the dipole moment alone is only part of the multipole story. So inspecting just the dipole moment of a molecule as you can see, is quite an incomplete story (although it is likely to be a major contribution to the summation). Looking at the (localized) molecular orbital analysis of difluoroethane, one can partition this into pairs of interacting filled and empty (localized) MOs, the so-called NBO approach. With gauche difluoroethane, one can identify six such terms, which together add to e.g. 16.6 kcal/mol, some 3 kcal greater than the equivalent sum of the orbitals of the antiperiplanar difluoroethane. It turns out that in the equivalent dichloroethane, the gauche interactions sum to 24.9 and the antiperiplanar to 21.9. So its clear that looking just at this specific interaction in the molecule, the so-called stereoelectronic interaction, both difluoro and dichloroethane should be gauche. Clearly, something else must be involved, since dichloroethane is experimentally antiperiplanar. A calculation of the total energy (which takes into account all the interactions in the molecules) does indeed show this conformation to be about 1 kcal/mol lower in free energy. The NBO terms above show the interaction between a filled and an empty orbital. But there is another, the so called bond-bond, or electron pair repulsions involving (approximately) four rather than two electrons. We know this by the rather more familiar term of steric repulsions, and this can be reduced to inspecting the non-bonded distances between atoms, via the sum of their van der Waals radii. It turns out that in gauche difluoroethane, the non-bonded F…F contact is a little larger than the van der Waals radii sum, whereas in dichloroethane, it’s a little shorter. Whether it’s this that makes the dichloroethane different from the difluoroisomer needs further investigation. As I said at the start, this is a complicated story. Some stories in chemistry are dominated by a few terms (in Mathematics, we would call this a strongly convergent series), but others may involve a fine balance between a greater number of terms (a weakly, or even poorly convergent series). I suspect its the luck of the draw which one gets. Clearly, in chemistry we constantly strive to find strongly convergent explanations of phenomena. I suspect the difluoro/dichloroethane phenomenon is probably weakly convergent than we would like! But that simply means we have to find another summation that converges more strongly! Fantastic explanation! Thank you for the reply, chemistry does indeed appear to be a complicated story. I’ll have to look at this stuff as a case by case basis, rather than creating generalizations. You have created a very helpful web site, keep up the great posts! I can add a little to the explanation offered before. The NBO 5.9 program offers a quantitative way of summing the pair-pair repulsions in a molecule, and hence an interesting way of estimating the Total disjoint NLMO steric exchange energy from pairwise sum, or the steric effect to you and I. The two values for gauche and trans difluoroethane are 74.1 and 73.8 kcal/mol, whilst those for dichloroethane are 69.8 and 68.4 kcal/mol. In other words, the gauche isomer of dichloroethane has a greater steric effect than that of difluoroethane. This is pretty much what I said above (phew! ), but its nice to have some numbers to attach to that statement. Ref. 259 in my recent “tutorial review” on hyperconjugation (10.1002/wcms.6/pdf) reports another NBO analysis of this interesting problem. For the last four years, I have been assigning NBO analysis of difluoroethane to my graduate class as one of the computational homework assignments. Students enjoy doing the the detective work and connecting NBO analysis of stereoelectronic interactions described in your post with the conformational equilibria. I will make sure to include dichloroethane as well next year!